Shakespeare in the Park is a term for outdoor festivals featuring productions of William Shakespeare's plays. The term originated with the New York Shakespeare Festival in New York City's Central Park, originally created by Joseph Papp. This concept has been adapted by many theatre companies, and over time, this name has expanded to encompass outdoor theatre productions of the playwright's works performed all over the world. Shakespeare in the Park started as an idea to make theatre available to people of all walks of life, so that it would be as readily available as library books. The performances are more often than not free admission to the general public, usually presented outdoors as a summer event. These types of performances can be seen by audiences around the world, with most festivals adapting the name for their productions, such as Vancouver's Bard on the Beach. Many festivals incorporate workshops, food, and other additions to the performances making this type of theatre experience an interactive community event. Shakespeare in Delaware Park describes itself as the United States' 2nd largest Shakespeare festival (following New York Shakespeare Festival). It is held in Buffalo, New York's Delaware Park. Inspired by the New York Shakespeare Festival, Robert "Bob" Glenn started The Shakespeare Festival of Dallas in 1971 as a free summer Shakespeare Festival. Renamed Shakespeare Dallas in 2005, the company produces three free Shakespeare productions each summer at the Samuel-Grand Amphitheatre in Lakewood. The Heart of America Shakespeare Festival was founded by Tony winning Broadway producer Marilyn Strauss in 1993 at the urging of Joe Papp with a production of The Tempest in Southmoreland Park. In 1998, they began to produce two productions per year, with a total of 23 production at the start of the 2011 season. Kentucky Shakespeare Festival is a non-profit, professional theatre company in Louisville, Kentucky that produces and performs the works of William Shakespeare. 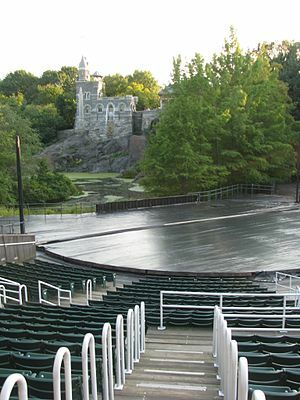 The main productions offered are the annual summer series of plays presented free to the public at Central Park. This series, commonly called "Shakespeare in Central Park", sprung from an initial production in the park by The Carriage House Players in the summer of 1960. They also perform shows in other venues, as well as conduct educational programs related to acting and other theater-related skills. The Hudson Warehouse present free Shakespeare and other productions at the Soldiers' and Sailors' Monument in Riverside Park. New York Classical Theatre present free Shakespeare productions in New York City's Central Park and Battery Park, among other locations. At the end of each scene, audience members participate by following the actors to a new space in the venue. This Philadelphia theater company offers the largest, free outdoor production of Shakespeare's plays in the greater Philadelphia area. Shakespeare in Clark Park was formed in the fall of 2005 by Marla Burkholder, Maria Möller, Tom Reing and Whitney Estrin. In their inaugural season, Shakespeare in Clark Park presented four performances of Twelfth Night, drawing an audience of over 2,000 people. Those audiences have grown to over 5,000 and the annual show has become a staple of summer in Philly. The South Dakota Shakespeare Festival (SDSF) was formed in 2011 and launched its inaugural season in Vermillion, South Dakota, in June 2012. Since the summer of 2012 the SDSF has been offering fully produced professional Shakespeare performances in Vermillion’s Prentis Park and daytime arts educational offerings for youth and adults. The Southern Shakespeare Festival occurs annually in Tallahassee, Florida. The festival's first incarnation existed from 1995–2000. In 2012 a group of scholars saw an opportunity to revive the free outdoor festival at the award winning Cascades Park. The Australian Shakespeare Company was founded in 1987 by Glenn Elston, the man responsible for pioneering outdoor theatre performances of William Shakespeare's plays in Australia. The company has performed for more than a million people across all the different regions of Australia. They make it a mission to draw audiences of all age groups to their shows. The Shakespeare in the Park Festival at Toowoomba is another location for al fresco Shakespeare performances in Australia. Originally presented in Toowoomba's Queen's Park (2004-2011), this festival recently moved (2012) to the University of Southern Queensland's Toowoomba campus. Presentations on the open-air mainstage since the festival's inception in 2004 include The Tempest, Romeo and Juliet, Macbeth, Comedy of Errors, Taming of the Shrew, Hamlet, Twelfth Night and A Midsummer Night's Dream. Cast includes Creative Arts students from the University of Southern Queensland and also includes a variety of other events to compliment the mainstage offering each year. Western Australia also holds a large Shakespeare in the Park festival in Perth at King's Park Botanical Gardens. The plays for this festival are set to be performed by the same company (Shakespeare WA) through 2014. This festival is usually held from mid January to mid February, and is the largest single theatre event in Western Australia. Summer Shakespeare has been an annual outdoor theatre event in the capital city, Wellington, since 1983. The large-scale, large-cast productions have taken place in a variety of settings including the Dell in the Wellington Botanic Gardens, Civic Square, Museum of New Zealand Te Papa Tongarewa, onsite at Victoria University and at Gladstone Vineyard in the Wairarapa. Productions have ranged from some of the most popular to some of the most obscure plays in the Shakespeare canon. Shakespeare in the Park has been performed in the outdoor amphitheatre at The PumpHouse Theatre, Lake Pupuke since 1996. incorporating traditional costumes and settings. The Dream in High Park is the oldest annual outdoor theatre event in Canada, currently entering its 33rd season in 2016. Since its inception in 1983, an estimated 1.3 million people have enjoyed the tradition of theatre under the stars. The Canadian Stage Company, who performs the Dream, is nationally and internationally acclaimed, and is Canada's leading not-for-profit contemporary theatre company. It was founded in 1987 with the merger of CentreStage and Toronto Free Theatre, and is dedicated to programming international contemporary theatre, and to developing and producing landmark Canadian works. Shakespeare In The Ruff was born from the ashes from the previous company Shakespeare In The Rough which performed in Toronto's East End neighbourhood of Riverdale between 1994 and 2006. The new company launched in 2012 focuses on creating unique contemporary adaptations of Shakespeare's work and providing opportunities for emerging artists. As part of the company's community work, they run a youth apprenticeship program called the Young Ruffians which pairs up high school students with a member of the professional company for the duration of rehearsals and performances. Shakespeare by the Sea Festival Inc., a community-based organization, produces and promotes artistic works with a focus on William Shakespeare. It unites seasoned and developing talent and aspires to excel in all aspects. The festival is the longest running outdoor summer theatre event in the St. John's area. Since 1993, the Shakespeare by the Sea Festival has been performing the works of the famous Bard all around the St. John's area – from the cliff-top meadows of Logy Bay to the historic World War II bunkers at Cape Spear – from the cobblestoned courtyard of the Murray Premises to the lush landscapes of Bowring Park. Since that time, the Festival has grown into a much-anticipated annual event. Repercussion Theatre has been touring parks throughout Montreal for over 25 years, bringing the classics to people where they live, for free (with donations graciously accepted). They are experienced in providing Shakespeare in the Park across the city, entertaining people who may otherwise not be exposed to live theatre. Repercussion Theatre was founded in 1988, when they played four shows in front of 800 people in Beaconsfield, Qc. Now, they perform to over 10,000 people each summer across the island of Montreal and beyond - with a commitment to cultural diversity, gender equity, and infusing Shakespeare's plays with a decidedly Montreal flair. They are the only company in Montreal to consistently produce a Shakespeare production each year. The company's first Artistic Director was Cas Anvar (followed by Kevin Orr and then Paul Hopkins) and the current Artistic Director is Amanda Kellock. In 1990, Margo MacDonald and Heather Jopling, rooted in the belief that Shakespeare should be seen and not read, recruited almost a dozen young performers and took to the streets. They derived inspiration from the rogue Elizabethan players that once entertained audiences outdoors at the Globe theatre, named themselves A Company of Fools, and began performing for crowds on the streets of Ottawa. In 1998 the Fools began performing in Ottawa City Parks with college shows, and in 2002 the Fools launched the Torchlight Shakespeare series. Besides mounting an average of two productions a year, the Fools hold three annual events (Twelfth Night Celebration, Valentine's Day Sonnet Delivery, and the Ottawa Theatre Challenge) and are active in the Ottawa community. Shakespeare in the Ruins (SIR) is Manitoba's only professional Shakespeare company. The company was founded in 1993 and is noted for its productions at Trappist Monastery Provincial Park. The Freewill Shakespeare Festival, formerly known as the River City Shakespeare Festival was founded in 1989. It is produced by the Edmonton, Alberta-based "Free Will Players" every summer from late June to mid July. The Festival includes full-scale professional productions of two plays by William Shakespeare, as well as Camp Shakespeare - a summer drama camp for youth ages 8–16. All Festival activities take place in the 1,000-seat Heritage Amphitheater in Edmonton's beautiful Hawrelak Park. In 2008, the festival was renamed the Freewill Shakespeare Festival. Bard on the Beach Shakespeare Festival was established in 1990. The plays are staged in Vanier Park on Vancouver's waterfront, in open-ended tents, from the end of May through September. Over the years Bard on the Beach attendance has grown significantly from 6,000 patrons in 1990 to more than 90,000 patrons in 2009. The programming has of course expanded from one play to four, and from 34 performances to 215 two decades later. Shakespeare in the Park currently takes place throughout many European countries. In Europe, ever since the Elizabethan period, theatre has been a crucial part of their cultural heritage and history. The Shakespearean performances take place mostly all over Europe from the East to Central Europe. One of the three Globe Theatres is located in Germany and is called "The Globe Neuss". It was founded in 1991 and is famous for its annual International Shakespeare Festival, where companies from all over the world come to perform. The German city of Bremen hosts The Bremer Shakespeare Company, which features the largest Shakespearean repertoire on a German stage. Performances at Bremen's Bürgerpark are a huge cultural attraction each year, and the festival also lets guests participate in The Dramatikerwerkstatt - a playwright workshop – where they explore the theatrical process from within. The Footsbarn Theatre Company based in France is a travelling troupe who perform outdoor theatre all over the world. In Italy, The Globe Theatre is located within the museum park in Villa Borghese. The stage is a classical "wooden o" structure, reminiscent of the original Globe stage, and is perfect for staging Elizabethan style productions. Brussels Shakespeare Society based in Belgium has been performing "al fresco" productions of Shakespeare's plays since the summer of 1976. Theatrum Gedanense Foundation annually organizes the International Shakespeare Festival in Gdansk, Poland. A week-long festival of outdoor plays and events, the company strives to include not only Polish adaptations of Shakespeare plays, but foreign ones as well. The British Shakespeare Company; this Leeds-based festival attracts 15 000 people each summer. The British Shakespeare Company is also responsible for helping to initiate a government policy to send "Shakespeare Packs" to school children of all ages and backgrounds, in an effort to introduce Shakespeare at a young age. London's Regent Park is a very special place for an outdoor Shakespeare experience, as the original productions of these great works took place in this very city. The Open Air Theatre Festival has become a famous tourist location, where many locals and tourists alike gather to see the performances. Open Air Theatre was first established in 1932, and is considered one of the largest auditoria in London. The oldest outdoor theatre in all of Britain hosts over 130,000 people annually in its sixteen-week season. Regent Park is the host of one of London's summer attractions. Since the very first production of Twelfth Night in 1932, the Open Air Theatre has been the home of many seasons of Shakespeare; but also has staged other classical plays, operas, musicals and family shows. ^ Smith, Olivia (15 August 2009). "Success of free Shakespeare in the Park comes with a price for audiences - but it's worth the wait". Daily News. New York. Archived from the original on 19 September 2009. ^ "How it All Started". Heart of America Shakespeare Festival. Archived from the original on 27 January 2011. Retrieved 23 April 2011. ^ "The Australian Shakespeare Company - Australia's Biggest Outdoor Theatre Company". AustralianShakespeareCompany. Retrieved 2018-04-17. ^ Kellock, Amanda. "About Repercussion Theatre". Archived from the original on 2017-08-15. ^ "Shakespeare on the Saskatchewan". www.shakespearesask.com. Archived from the original on 2017-03-08. Retrieved 2017-03-08.